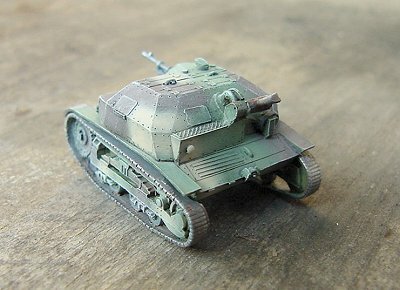 A cute little model, this kit makes a perfect afternoon project. 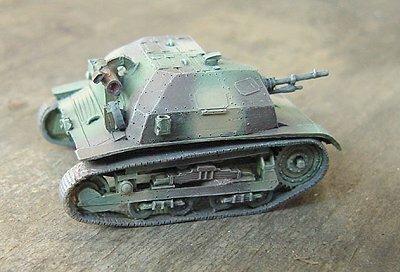 Consisting of only five parts (hull, two track/wheel assemblies, and two machine guns), the construction is quite simple, with the main task being the application of a decent paint scheme on such a small vehicle. The quality of the resin castings was pretty good, but there were several small air holes needing filling. The rivets are recessed pin holes, and in some locations, it is difficult to determine which are rivets, and which are air bubbles. I'm sure I missed a few. The hull is a single piece, with all hatches molded shut, and the muffler, spare wheel, and pioneer tools molded onto it. 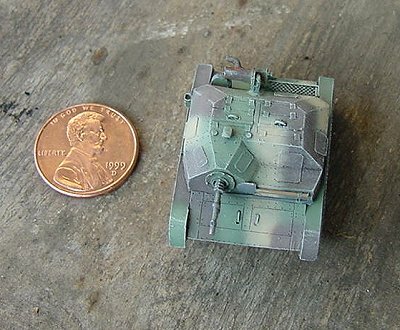 Perhaps this is one of Al.By's earlier releases, because some of their other kits (specifically, the UE Tractor) show that even on a kit this small, a hollow-cast hull with open hatches is possible. The wheels and tracks are molded as single pieces for each side. The detail on the wheels is quite impressive, but the tracks are a disappointment. It seems that the person who made these masters must have worn himself out making the finely detailed hull and wheels, and decided to finish the project by wrapping thick, undetailed belts around the wheels and calling them tracks. Granted, at this size, it's not going to be possible to achive the level of finesse possible with etched tracks, as comes with the PART TKS kit, but they certainly could have been better than they are. 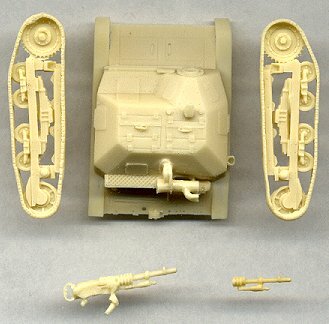 The machine guns are also not up to the same level of quality as the hull and wheels. The hull MG is a simple barrel to be glued to the front of the hull, and consequently, does not look too terrible. 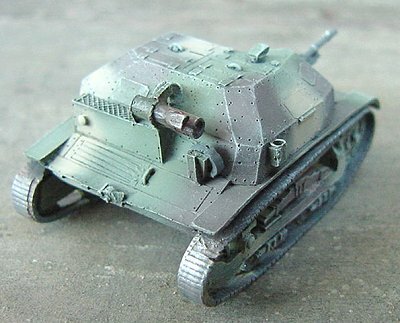 But the externally-mounted MG is fairly poor, and I left it off my kit. It is very lumpy, and looks like it was carved from wax, which is beginning to melt on a warm day. That is rather disappointing, considering Al.By's otherwise high standards of quality. I have no references for this vehicle. 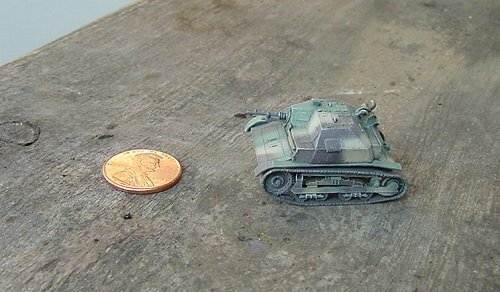 According to the dimensions shown at Michal Derela's Polish Armor website, this kit scales perfectly to 1/72nd. That is to say, it is really small. 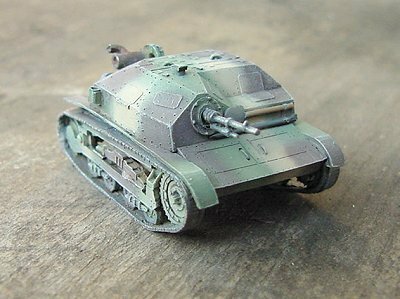 Michal confirmed for me that the base color of 1939 Polish AFV's was green, with tan and brown camouflage applied over the top of the green, so this is what I replicated with this kit. I painted a geometric pattern I saw on Michal's site, with blocks of color over the green. I used Testors Acryl acrylic paints. Some "in progress" photos of this kit may be seen in my Painting Techniques article. This is a very rare combat photograph of a TKS stalking a giant portrait of Abe Lincoln. Ultimately, this is a very fine kit, and very inexpensive. 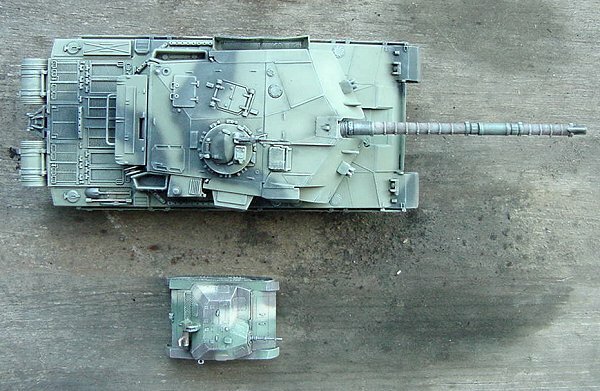 It will make an excellent addition to a wargamer's Polish Army, but for those who are looking to make a highly-detailed display kit, I would recommend trying to improve the tracks somewhat, or else go for the PART TKS kit, which is on the other end of the "complexity spectrum" from this reviewed kit. Who says size doesn't matter?? ?